1st half fine, but the oppo were poor and handed it on a plate. but 2nd half he was once again out-managed by the oppo. They got the tactics right, changed up their shape and we were under an absolute onslaught for 45 mins. I could never see a team withstanding that amount of pressure, and we didn't. Handball or not, it probably should have been 2-2 before then. He isn't proactive, he is reactive and passive. Just like the team. There is something fundamentally wrong with his philosophy. You've put it well. He must go now. Reactive and passive sum him up - the game was there for the taking but the Manager didn't have the guts to be proactive and tried to protect what he thought he had. It's not just the manager ( though he is obviously part of the problem) the players make so many poor decisions that they shouldn't be making, they have no fight or seemingly a will to win. We've slowly downgrade the squad until it's befret of leaders and players who can make a difference when we need it. Leaders I agree with, I posted a long waffling twitter rant the other day that bemoans the lack of leaders throughout the club right now. I mean, who is accountable for this mess ? Reed is the footballing guy, who I actually think if you take everything as a whole has done a decent job, but now seems has the ability to make decisions as he see's fit with no repercussions. Like you say I can't see any leaders in the club from a playing perspective right now, Romeu maybe, but just doesn't seem the right type. Pellegrino seems to have the backbone of a flump. As far as the players are concerned, this is the same team, plus a new CB and DM and a full season of Gabbi that finished 8th, got to a cup final and had Europe to contend with. Theres no reason why they shouldn't be performing better than they are other than the fact that the manager seems to be inept and I would suggest, having watched every game this year the players seem to know that. It seems to me as soon as they come under pressure its as if they almost know it will only end one way. The atmosphere for the Spurs game at home could get sour very quickly if Pellegrino stays. If the clown doesn't get fired tonight - the board are happy for us to get relegated is the only conclusion I can come to. I would get O'Neil and Keane in ASAP (surely we are a better proposition than Stoke?). Yea, I get the Keane gesture etc. but we need a hard c**t like him and he would be our HC! What in living jesus is McCarthy doing for the 2nd? I mean come on, he's supposed to be a goalkeeper. How have we managed to lumber ourselves with two keepers who can't keep goal. Maybe they're coached to not use their hands. More innovative thinking. The Southampton Way. I‘m going to take an infraction on the chin. Today feels like a defeat now, a point away isn't the end of the world, but with many of the other teams fighting relegation getting points including wins, the table is looking scary now. That will do our confidence no good and we're already at rock bottom, and Spurs up next. Sat back too much 2nd half. The lack of a trusted centre half on the bench cost us too, as we should have gone 3 at the back once Deeny came on. That would also have resulted in Davis being substituted and so he wouldn't have been on the pitch to give the ball away for the first Watford goal. If any pundit says "these things even themselves out" about the equaliser, I will fly back to England just too stalk and punch them. You can put your wallet away. Phil Thomson, Sky, was horrified and said "that why VAR is needed; a clear handball and the officials missed it." Agreed. We have a decent squad. It's not the players, it's the way they are managed. We have an 8th/9th squad. Problem is people see poor form, lack of confidence and just write players off, even if they've proved they can do it before. The manager's job is getting the best out of his squad. I think any reasonable manager could have this squad top half, then you can talk about spending to improve it further. Christ, even a poor manager would have the squad clear of relegation. Taking this squad down is another level of embarrassing. Originally Posted by monosaint Let's take the positives. We could have capitulated very easily in the 2nd half but managed to weather the storm and it looks like we were robbed by a handball. We have moved up one place and are not in the bottom 3. Let's not forget we are very low on confidence and this would have been a result we'd have taken before the game. We move on. Negativity from us doesn't help. Looking at replays McCarthy knew he wasn't going to get there with his head and was anticipating it going past the player.. I get the outrage, but people are being incredibly unfair. The first half was spectacular for Saints. really terrific football. We were set back by an illegal goal. This is football. crap happens. It feels like mob-rule to pile-in and blame it all on the manager. the same that happened to Puel. Personally, I see lots of signs of the team getting stronger. Thrilled for JWP. He's getting better every game. Long has been superb too the last couple games. We attribute way too much, good and bad, to the manager. Look what happened to our last 'great' manager Koeman. A losing run at a 'better' team. Reverse the order of the halves today, and everyone's feeling a lot better. My vote would be give Pellegrino a few more games. I think we'll turn this round. Horrible way to draw. Hope Docourre gets banned. Worst of all results, prolonging Pellegrino's stay while being of little value in terms of points towards survival. From top too bottom the club is rotten to the core. It’s 2005 all over again unless things change. Stephens and Hoedt, bambis on ice, hardly covered themselves in glory either. But shocking decision by the ref. VAR can't come soon enough. I am just getting numb to this. Was out and heard we were 2-0 up, and just knew we would be lucky to get a point. It was so predictable that we would sit back and try and defend and then concede right at the end. Mope should gave gone a long long time ago but I have no hope that he will. They say it is the hope that kills, well I have gone through that stage and entered the acceptance phase. Dreadful manager backed by a dreadful Board. My vote would be give Pellegrino a few more games. I think we'll turn this round. Remind me again, just how many games have we won this season? Also maybe check out the form table, that turn around is a long time coming. Bit of a pansy post for me. Time to wake up I think. First half was ok, but we made the most of Watford not being there. Would have been a crime had we not won that 1st half. There was nothing to admire and certainly no improvements to see in the 2nd half. Crap has been happening all season, this isn't something new. We have failed to beat Watford, Huddersfield, Burnley, Stoke, and Swansea. Not through 'illegal goals' or 'crap luck', it's through being coached and tactically managed by someone who is so clearly out of is depth that it's painful to watch. shocking decision by the ref. VAR can't come soon enough. I'm sure Whitey Grandad will arrive soon to tell you why you're completely wrong. All referees are perfect. Thanks for better explaining the thoughts I couldn't be bothered to express due to my impending sense of doom. But yeah, that. Useless Useless Useless - again the opposition change to 4 4 2 and he doesn't react - we sit back just like with Palace and same old story - you cannot do this game after game after game - I have had enough - MP is not a manager and he MUST BE SACKED!!!!!!!!!!!!!!!!!!!!!!!!!!!!!!!!!!!!!!!!!!!! !!!!!!!!!!!!!!!!!!!!!!!!!!!!!!!!!!!!!!!!!!!!!!!!!! !!!!!!!!!!!! Feel the same, not too comfortable with those two at the back either. Need someone strong back there as they look lost when a team pressures us. Feel the criticism of McCarthy is unbelievably unjust. I'll have to watch it again, but the movement of the ball on account of the handball was completely unpredictable, i.e. that still is not representative of how the ball reached that position. He had a cracking game, imo. But as above, I'd like to see it again. Reminds me of when Markus Bent fired in for Everton in the 2-2 draw at St Mary's when we were relegated. Speak for yourself. I wouldn't have taken it before the game and I doubt that many others would have too. Don't be a pratt. Of course I wanted us to win but understand the dynamics of football. I've supported Saints for over 60 years and have seen the highs and lows over that time, What I have learned is that the Fans' confidence is as much a part of the challenge as the Manager and Players. The TSN pundit said decoure realised he wouldn't get the header, and deliberately handled it in. So you can forgive McCarthy for expecting it to fly past him on his left. Fine to give props for the first half, but surely that means you have to acknowledge the capitulation in the second, rather than putting it down to bad luck? No one is making their decision based on this game. Managers turn clubs round all the time. It's a hugely important role. For any squad from 7th downwards, a good or bad manager is the different between 7th and relegation. How could it be more important? 0 wins in 10 PL games now, I believe. Think you are being harsh on Hoedt, he was actually battling and matching the physical stuff Watford piled on. Can't help him that he has Cedric, Bertrand and Stevens next too him who didn't impress me too much with that side of the game. I’ve had enough. That really is the last straw. It’s yet another weekend with a black cloud hanging over it. We are going down with this cvnt in charge. So naive. Handball or not, we’ve inivited the pressure again and failed to manage it again. Huddersfield, Arsenal and Palace games we tried and it failed, when the f*ck is he going to learn? Those pictures aren't showing the handball. He misses it with his head coming in from his left, and then lifts it from in front of McCarthy past him with his right hand. Utterly disgusting that it's been missed. Capitulation? Or an impressive Watford comeback. There are two teams in it. We're about the same level. We're playing away from home. I saw a lot of determined defending, and that could have been the end result were it not for the illegal goal. then the narrative would have been, a superb, professionally earned away point. We're going to be relegated from a league which is utter ****e this season, apart from the top 6, with a squad which should be 7th - 10th. Im surprised McCarthy didn't appeal a hell of a lot more. Not one of the pundits (ex-players) criticising Doucouré for cheating, it's easier to blame the ref. 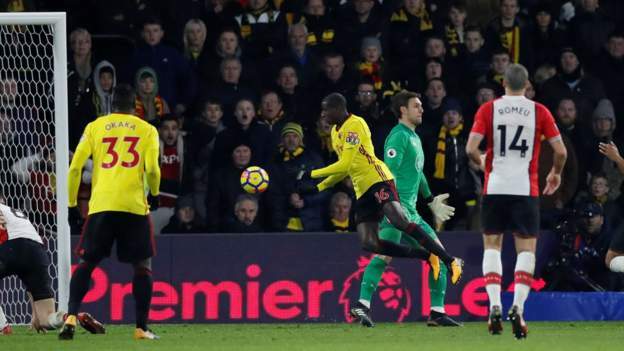 McCarthy didn't even try to save the second goal because Doucoure hand balled it past him, he was as gobsmacked as everybody when the goal was allowed. Made some good saves, caught crosses good punch under pressure and is an improvement on the out of form Forster. The second goal was a disgrace. It took to post 74 before anybody pinned the blame for the first goal on the right culprit. Step forward Steven Davis, under no pressure dithers on the ball turns one way then the other and tries to beat a man and loses the ball seconds later it's in the net. 100 caps and doesn't have the common sense to move the ball on, he had loads of time. I've made it plain my dislike of Davis, he is a liability and keeping Lamina on the bench for him was just another selection error. JWP, fair play to him, took his goals well with assists from Davis and Tadic. Long did really well with the spadework for both goals and was perhaps a little unlucky not to get a goal. If any saints fans bother to turn up I imagine SMS will be pretty empty for the rest of the season..
How many times have we let the opposition back in? Remember the times when being 2-0 up meant that was 3 points in the bag. Les needs to call in on Lady Luck and buy some players who know how to play to win a game of football. Then maybe let the manager be the dominant figure in the football department and not just a part of a model that is no longer working.